Last week’s Mad Men challenge, multiple deadlines at the day job, and a house full of mid-stream DIY and repair projects….all nearly ate me alive. I survived (whew! ), however, with renewed energy and am ready to finish my show n’ tell of 1960’s on-screen fashion. I made a deal with myself to wrap this up before I can start watching Season 5 of Mad Men (which started Sunday and is taunting me, begging for me to buy its season pass on iTunes). But, there’s no need to overload the senses. 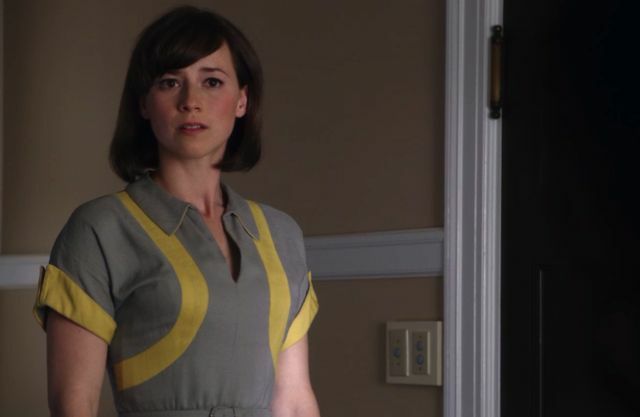 I’ve still got goodies to share…once I do, the girls of Sterling Cooper Draper Pryce can go back to inspiring my sewing. On to the 60’s fashion-spotting….this time I turned to television dramas, beginning with the mini-series, The Kennedys, that starred Greg Kinnear as the late U.S. President (1961 – 1963), John F. Kennedy and Katie Holmes as the iconic Jackie Kennedy. Jackie Kennedy, (or Jackie O.) was a great representation of this fashion era. The show did well styling Katie Holmes (who’s probably much shorter in stature than the real Jackie) as the quietly clever and graceful First Lady. This white wool suit with wide, black leather belt is my favorite. I’ve always wanted to rock a white skirt suit without looking like I was taking myself too seriously…this one is just right. For a hot-minute, ABC got on the 60’s bandwagon (an obvious response to the popularity of Mad Men) and aired one season of the show (before cancelling it), Pan Am. It followed the lives of beautiful, well-groomed Pan Am stewardesses and their equally handsome pilots as they flew all over the world, got caught up in drama, adventure, and romance. All in perfect, 1960’s hat-and-gloved style. And, this one (of course), was the winner of my deepest affection. I either need to renew my wedding vows or get a divorce and re-marry (probably the same guy) so I can make this dress and walk down the ailse in it. This entry was posted in Films for Fashion and tagged 1960's, films for fashion, inspiration, Jackie O., Pan Am. Bookmark the permalink.